This is a quick post I wanted to share with you. About a month ago, many of you probably know that I was a bridesmaid in my BFF's wedding. 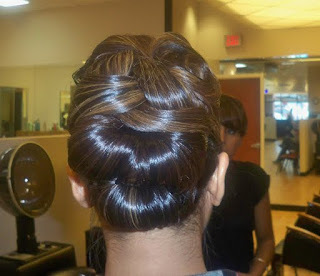 I didn't have any good hair shots to show you back then...so I wanted to show you my updo. The hairstylist was excellent...he knew how to deal with a variety of hair textures. 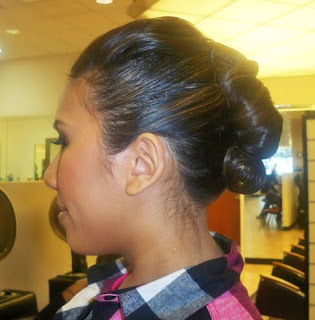 Oftentimes, my hair doesn't hold well in updos because it's really thick and slippery. He solved that problem by curling the entire thing with his little egyptian clicking hair curler thing-a-majig, and then placing it into several pony tails to hold the weight. He then pinned and pinned and sprayed and sprayed. The side view. I like how he gave me a little poo f at the top so that I don't feel bald lol. For the front he did a little swirl to the side. 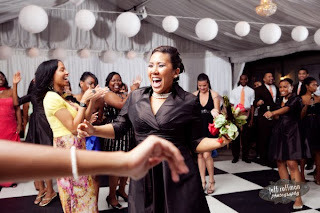 My hair lasted the entire night...even through the soul train line and furious fight for the bouquet. Ren that hairstyle is simply to de for! It's gorgeous! I need to play with extensions now that I cut all my hair off! I LOOOOVE the way the back looks. Beautiful! Pretty! Your hair is so pretty and shiny! i love this. im just tryin to figure out how he did it!! looks complicated!! simple and sophisticated...i love it! OMG! This is sooooo pretty!! Awesome!!!!! Who is he?? Whats his name? Do tell please! amazing! i can't figure out how he did it either.